Traffic enforcement cameras that record offenses, including carpool lane violations, speeding and illegal turns, eliminate the need for police officers to write tickets. If a camera has captured your traffic violation, you will usually find out by mail. Around the country, there are at least 4,100 cameras that detect traffic violations. If you suspect that you may have received a photo-enforced ticket, there is a way for you to find out for sure. Ensure that your driver's license information, especially your address, is current so that if you do receive a photo-enforced ticket, it will be mailed to the correct address. Search the website of the traffic enforcement agency for your jurisdiction. Some jurisdictions, such as King County, Washington, allow you to check tickets by entering your car's license plate number. You can find this information by searching your city, state and the words "photo-enforced tickets" together. Wait for a notice to arrive in the mail. The state usually mails photo-enforced tickets, containing details of the offense, cost of the fine and a picture record of the traffic violation. Photo-enforced tickets can cost almost $200. You must pay the fine for the ticket or else face possible collection efforts. Some jurisdictions do not renew license plates for vehicles with unpaid photo-enforced tickets. 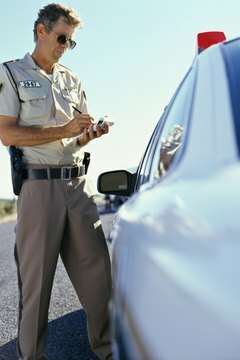 In many jurisdictions, photo-enforced tickets do not affect your driving record negatively. In some cases, a police officer will hand-deliver a complaint and traffic ticket to the violator, especially if the person has not responded to attempts to collect the fine for the photo-enforced ticket by mail. Time: This Map Shows the Location of Every Traffic Camera in the U.S.
(Lisa)Thompson, Elizabeth. "How to Check If I Got a Photo-Enforced Ticket." , https://legalbeagle.com/12025798-check-got-photoenforced-ticket.html. 17 March 2017.